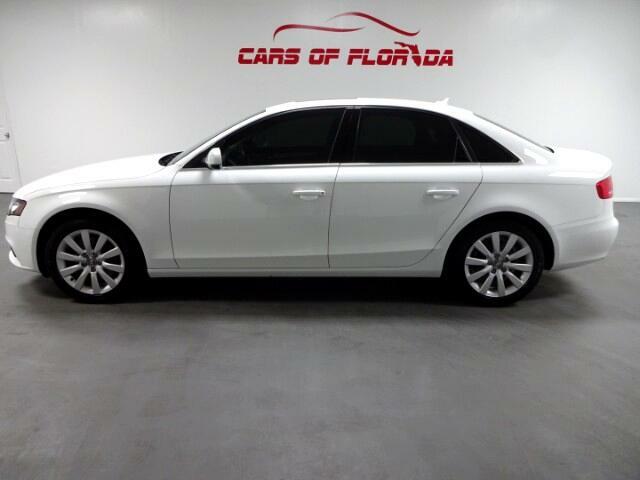 Cars of Florida is proud to announce this beautiful 2012 Audi A4 Premium Quattro. There are absolutely no blemishes on this low mileage immaculate Audi. Fully loaded with all the bells and whistles. This vehicle was a 2 owner Florida vehicle. Inside the cabin you are greeted with premium German Quality leather and accents. Exterior is a beautiful polar white with gorgeous iconic Audi LED lights. This car appears to be brand new! Why pay retail when you can get this for less than half the price of brand new?! This vehicle comes with all the books and manuals and three remote keyless go Fobs! Amazing acceleration and handling while not having to sacrifice fuel economy! Hurry this one will go quick! Financing options and extended warranty options available as well. Buy with ease and confidence!